Know how to program? 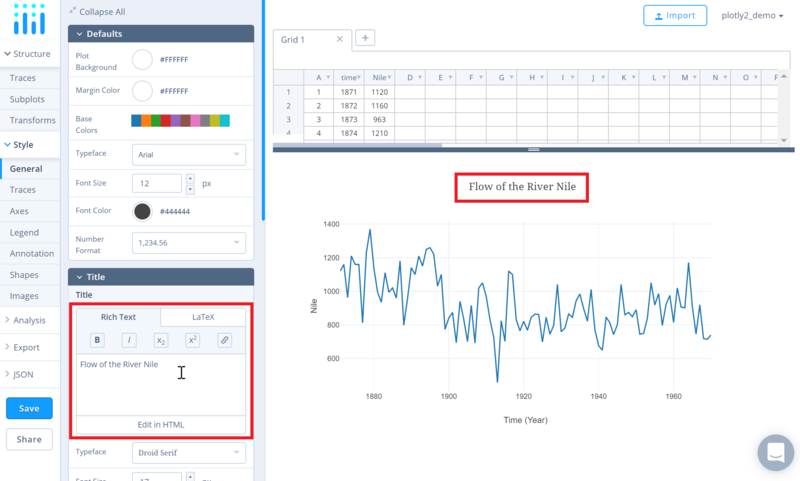 See how to create this in Python or R.
A type of graph that shows the relationship between two variables with a line that connects a series of successive data points. Before getting started with your own dataset, you can check out an example. First, select the 'Type' menu. Hovering the mouse over the chart type icon will display three options: 1) Charts like this by Chart Studio users, 2) View tutorials on this chart type, and, 3) See a basic example. Clicking the 'See a basic example' option will show what a sample chart looks like after adding data and editing with the style. You'll also see what labels and style attributes were selected for this specific chart, as well as the end result. 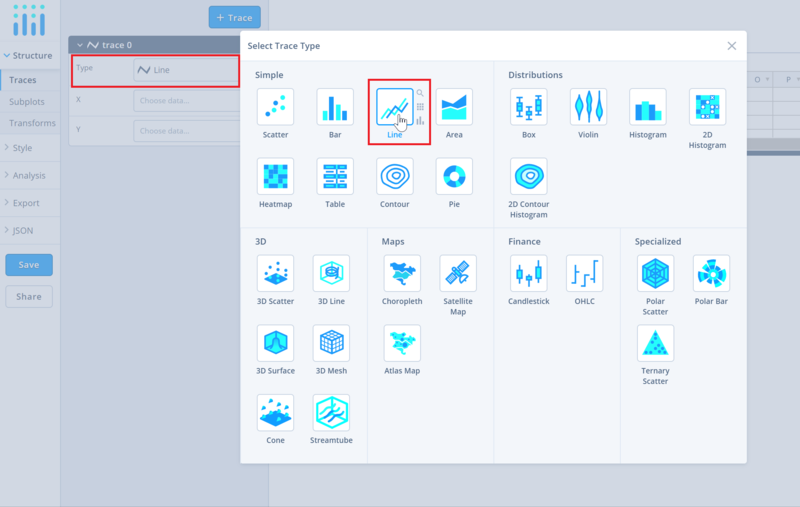 You can also use the data featured in this tutorial by clicking on 'Open This Data in Chart Studio' on the left-hand side. It'll open in Chart Studio. Head to Chart Studio and add your data. You have the option of typing directly in the grid, uploading your file, or entering a URL of an online dataset. Chart Studio accepts .xls, .xlsx, or .csv files. For more information on how to enter your data, see this tutorial. After adding data, go to the 'Traces' section under the 'Structure' menu on the left-hand side. Choose the 'Type' of trace, then choose 'Line' under 'Simple' chart type. Next, select 'X' and 'Y' values from the dropdown menus. This will create a line trace, as seen below. The 'Style' menu displays many options to modify characteristics of the overall chart layout or the individual traces. To see more options about styling the chart visit the style and layout section of the Chart Studio documentation. 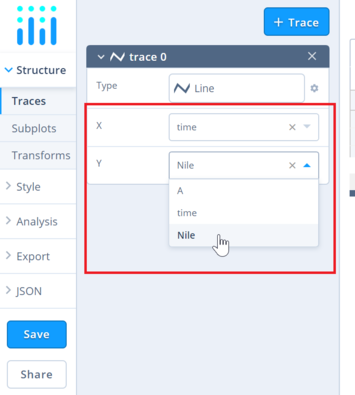 To change the properties of the line trace, go to the 'Traces' section under the 'Style' menu. To display markers along the line, click the checkbox corresponding to 'Points' under the 'Display' option. To set the plot title, go to the 'General' section under the 'Style' menu and type in the plot title within the textbox provided under 'Title'. Another approach is to click and then enter the title directly on the plot interface. The same can be done for the axes title and the legends. To save the plot, click the 'Save' button on the left-hand side. A save modal will appear, as seen below, where you can specify the filenames and privacy settings for your plot and data grid. For more information on privacy settings and how sharing works, visit Chart Studio's sharing tutorial.